Bean Fear | What Am I Eating? I grew up in the land of canned beans. Black beans, re-fried beans, pinto beans, kidney beans, great northern white beans, even green beans, all from the can. I helped my mom can peaches, pears, cherries, green beans and plums in the summer heat. We took out our frustrations on large batches of strawberries, blackberries and raspberries, smashing them into submission with generous quantities of sugar for homemade freezer jam. We peeled and sliced apples in the fall for homemade chunky applesauce and my mom’s famous apple pies. So much work, but so worth it. My mom conquered these challenges with grace, but found dried beans intimidating. She found them too time consuming (right, homemade canned pears take no time! ), and thought they never tasted right. Funny to me now, that such a simple ingredient can scare even those with the greenest thumbs and greasiest elbows. Now, guess my favorite kitchen staple. Yes, dried beans. So versatile, tasty, nutritious, satisfying and inexpensive! Even my mom no longer fears cooking this wonderful nutrient source. Currently, black beans, pinto beans, great northern white beans and pink beans all line my shelves. If I cook the beans myself, I control the amount of salt and flavorings added, not some giant corporation. I can cook the beans with onions and garlic, and let them absorb all the wonderful flavors. Just don’t add salt or anything acidic (tomatoes, vinegar, lime juice, etc . . .) until the last five minutes of cooking, after the beans soften. Salt and acid toughen the beans if added too early. Smash pinto beans with sautéed onions and garlic for homemade re-fried beans not even close to the canned variety that always taste like vomit (at least to me). Puree navy beans with roasted garlic or roasted red peppers for a delicious mayonnaise replacement. Stir great northern white beans, spinach and homemade pesto into chicken soup instead of pasta. So many possibilities, I never need to make the same recipe twice. My latest bean adventure includes homemade tomatillo salsa, diced tomatoes and avocados, cilantro, green onion and queso fresco. 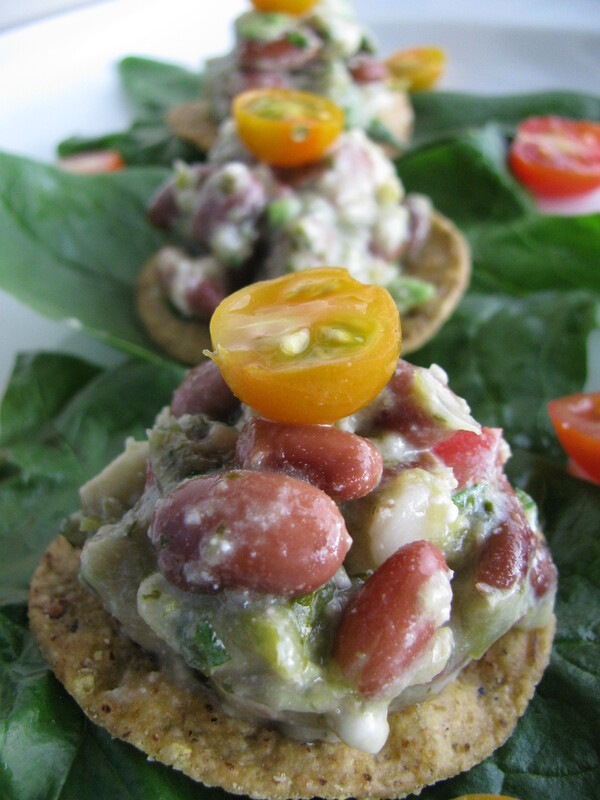 Serve with chips for a yummy dip, or on top of spinach leaves for a cold taco salad. If your bean fear stems from a less than desirable side effect (to put it nicely!) that only means you need to eat more beans! Believe me, the more you eat, the more your body builds up a tolerance to them. So, step away from the canned food aisle and into the land of heavenly, homemade beans. Cover the beans with water and soak them overnight. They will expand, so make sure to use plenty of water and a large container. Drain the beans and rinse them well. Place them in a large pot and cover them with water. Add the garlic cloves. Bring the water to a boil over high heat, reduce the heat to medium low, and cook them at a fast simmer for about 45 minutes, or until the beans are tender. Add salt and pepper to taste, and continue cooking for 5 more minutes. Drain the beans, but do not rinse them. Discard the garlic. While the beans are cooking, prepare the tomatillo salsa. Preheat the oven to 350 degrees F. Roast the tomatillos and garlic on a rimmed baking sheet for about 15 minutes, or until tomatillos soften slightly and change color. Remove from oven and cool briefly. Puree the tomatillos, garlic, green onions, cilantro, water and salt and pepper until smooth. Pour the warm salsa over the warm, drained beans, and refrigerate until cold. Combining the salsa and beans while they are still warm lets the beans soak up more flavor. While the beans are cooling, prepare the rest of the salad ingredients. Roast the poblano pepper under the broiler, turning occasionally until the skin is black and blistered. Immediately put the pepper in a plastic bag and refrigerate until cool enough to handle. When cooled, peel off the blackened skin and remove the stem and the seeds. Cut the pepper into 1/4 inch dice. Combine the diced pepper, tomato, avocado, cilantro, green onions, and queso fresco with the salsa-marinated beans. Adjust seasoning to taste with salt and pepper. Serve with corn chips. on July 7, 2010 at 7:48 PM | Reply Whole Wheat Tortillas with Pinto Beans « What Am I Eating?